Fashion Footing: Free 6 Piece Julep Gift with Purchase! Offer expires 11/24/2014 at 11:59pm PT, or while supplies last. Promotional code SHINETIME must be entered at checkout. 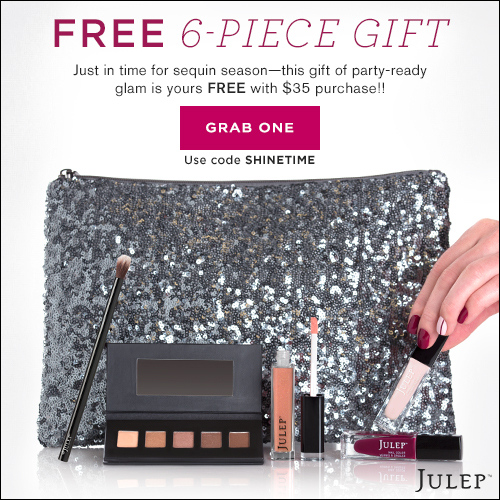 To receive free gift, add a Shine Time Gift set to shopping bag in addition to $35.00+ of other julep.com products. Offer may not be combined with any other promotional code. Orders placed for the Monthly Maven Reveal (e.g. monthly Maven Boxes, Upgrade Boxes, and add-ons) are not eligible. No exchanges or returns on free gift. No adjustments on previous purchases. Taxes vary by location.